TravStar1 Point Of Sale SystemManager's Work Station Daily ProceduresHow Do I Run the Media Detail Report? This lesson will teach you how to run the Media Detail Report. From the Daily Procedures tab, click on the "Media Detail" button. 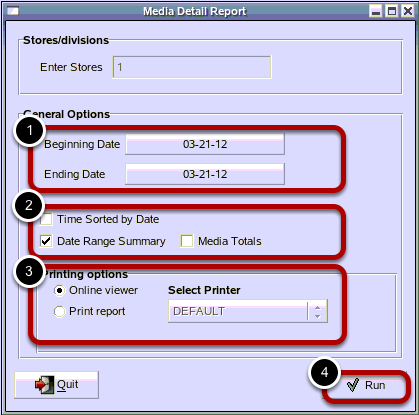 The Media Detail report prints a detailed list of all the tender media taken through store registers.It is also used to help reconcile billing company statements against daily media collected at the register. (1) Click inside the Beginning Date and Ending Date boxes to chose the report date range. These default to today's date. (2) Click inside the Time Sorted by Dates check box to display transaction times. Click inside the Date Range Summary check box to summarize the media into selected date range. This option is only valid when running the report for more than one business day. Click inside the Media Totals check box to total media instead of listing out each transaction. This option is only available when Date SUmmary Range is checked. (3) Click a print option for the report. This defaults to Online Viewer. From the Online Viewer you can still choose to print the report. (4) Click on the "Run" button to run the report. Here is an example of what the Media detail report look like. Prev: How Do I Run a Shift Report? Next: How Do I Declare Cashier Tills?